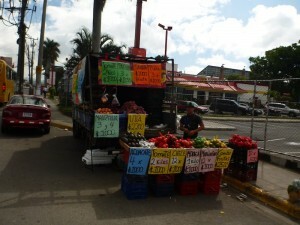 A man sells fruit on the road in Costa Rica in front of one of the country’s 50 McDonald’s restaurants. 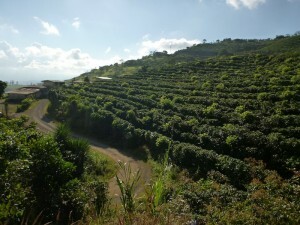 “Everything in Costa Rica cuesta rica.” That was Monika’s spanglish catch phrase describing her and Martine’s experience riding through the country. I had met the two Swiss girls in Baja California, they were cycling north on their way to Canada having already ridden all the way from Argentina, and their negative review of Costa Rica would be the first of many that I would receive along the way. 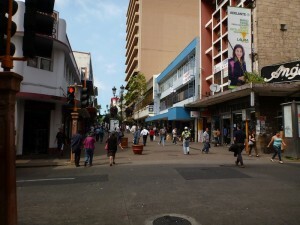 Costa Rica is expensive, the people aren’t friendly, it’s overdeveloped, it’s too touristy, there are too many american’s there, it’s very materialistic, it’s really expensive, it’s like they don’t want you there, it’s beautiful but pricey, they’ve sold out, it looks like the US with McDonalds and Strip malls, San Jose is an ugly city and on, and on, and on… In Honduras I met another cyclist that said it was hard to find friendly people to stay with along the road. In short, the general consensus amongst the budget travel community is that Costa Rica has nothing to offer that you can’t find for half the price elsewhere in the region. As Tony and I drew nearer and nearer to this little country I began to get desperate for a good review, any good word, about this proud little place. It wasn’t until Nicaragua that I finally met four people who had been living in Costa Rica, and to my relief they all spoke positively about their experiences – one even raved about it – and so I let my hopes go up just a bit. My sources after all were extremely reliable; 19 year old young ladies who had hardly any travel experience from (wait for it…) the United States of America. Day one was a nightmare. 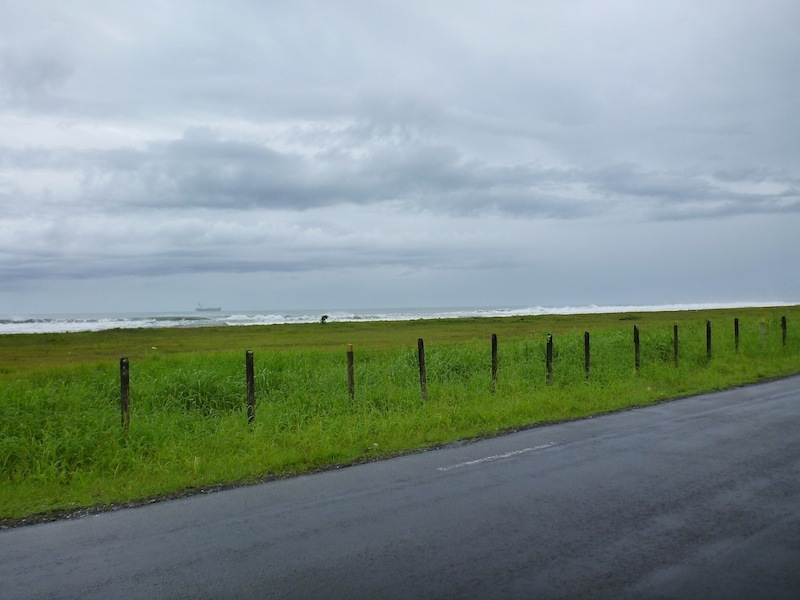 On the tour we are beginning to run short on time, money and travel spirit, and so – in light of the negative reviews – Tony and I decided to “skip” Costa Rica. By “skip” we of course mean “pass through ‘quickly’ ”. By “quickly” we of course mean at an average speed of 15 kph. That’s practically flying. Our first day in Costa Rica was horrible. We should have been ready for it, but no, it was truly shocking. First, we crossed the border quickly and without paying a visa fee, they clearly didn’t care about who I was and even laughed at me when I told them I didn’t have a bus ticket because I was traveling on a bicycle. Later on the road, Tony and I couldn’t ride in peace because we were constantly being distracted by annoying smiling people giving us the big thumbs-up sign (as if we don’t know what that really means!) and wishing us a “good trip” (sarcasm is so childish). Stopping at a petrol station we found out that people drink water from the tap here (gross!) and that it’s safe, free and easy available for everyone. Of course though, “free” isn’t exactly accurate as people in Costa Rica are very nosy and want to talk to you, sometimes for as long as 20-30 minutes, even after they have filled up your bottle! Then, back on the road, it didn’t take long for the Costa Rican drivers to show their aggressive nature. If you are planning to cycle through Costa Rica you need to be aware that some drivers and will pull up right along-side you, roll down the window, and then start yelling at you whilst thrusting bananas and other fruit in your face, forcing you to take it. It was a draining ride, and unfortunately the day ended badly as well. 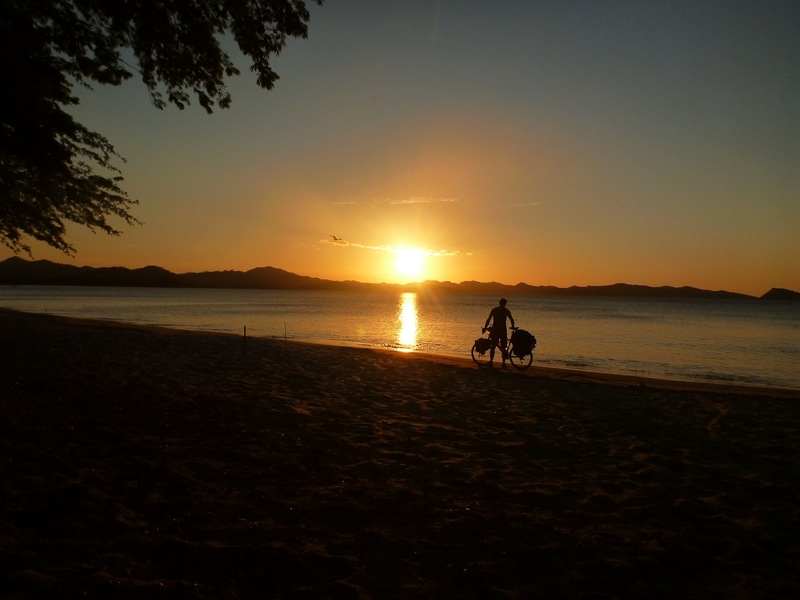 I ended up camping on a beach – Playa Soley to be specific – near a little police station. It soon became apparent why it was free to camp there. A blinding sunset, sand literally everywhere, more free tap water, more free food forced on me, and more time-consuming chit-chat had me gritting my teeth with rage by the time I crawled into my tent to try and get some sleep. It was far to quiet though and I spent ages listening to the soft lapping of waves and the gentle roar of the ocean before finally pure exhaustion allowed me to unclench my fists and drift of into the sweet escape of my dreams. How on earth was I going to survive another week in this country?! It´s really not that bad. In the end, Tony and I did survive. We now sit in Puerto Viejo, a small Caribbean beach town less than 50 km from the Panama Border. 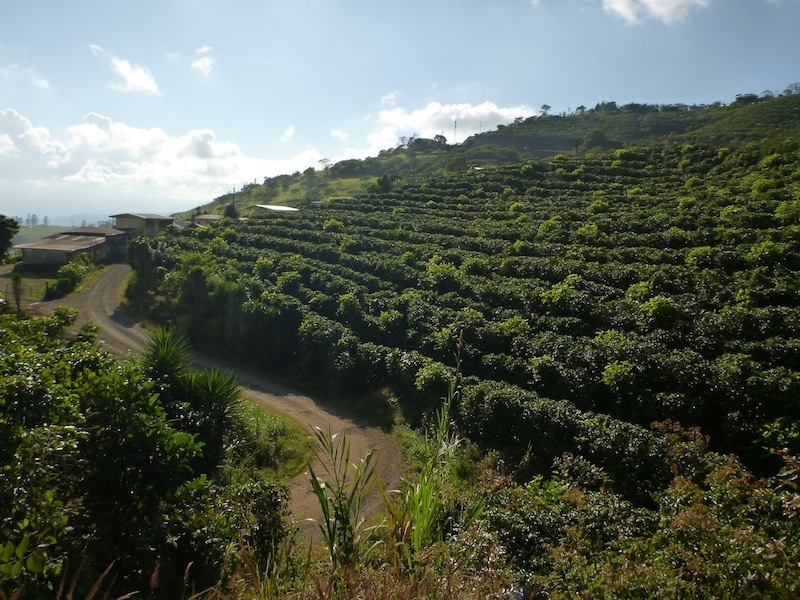 Costa Rica has been the eighth country of the Tour de Zack y Tony and we have passed through it very quickly – just 12 days – eager to get down to Panama. Sitting here in Puerto Viejo though, I look back on my experiences in this country and I fail to find an explanation for the extreme negativity – at times anger and disgust – I had been getting from other travelers when asked about Costa Rica. It’s true, compared to the rest of the region, Costa Rica is expensive, more developed, and has a tourism industry that caters more towards American tourists on packaged holidays than it does backpackers on a tight budget. Be prepared for $9 Subway foot-longs and $70 canopy tours. But, there is still plenty of unbeaten path and with a bit of travel savvy and by keeping away from the tourism vultures it can still be done on the cheap. $2.20 beers in a bar, $11 hostels, and $4 set lunches really isn’t anything to get uptight about (and those are prices in San José). It is also true that it has “sold out” to America. By that I mean that the tiny country boasts American-style strip malls and supermarkets along with 50 McDonald’s restaurants, 31 Burger Kings, 13 Wendys’, and a host of other US franchises from Taco Bell to Tony Romas. And yes, there are a lot more American’s living here, running businesses here, studying and traveling here than in other countries in the region. The country got something in return though; they are one of the safest, most successful, most stable countries in Central America. By success, I mean that even the road laborers that I hung out with one evening think that life in Costa Rica is good and easily affordable. Finally, yes, it is also true that San José is an ugly city. It´s colonial past is barely perceivable amongst the mess of badly planned infrastructure, hastily built concrete buildings, and tacky advertising. But then, every capital city in Central America is ugly. San José though offers so much more than first meets the eye. There are trendy bars offering quality live music in every genre, small theatres, art galleries, reputable universities, diverse street art, and vibrant public squares. There is a definite good vibe to be found here… if you can afford it. Admittedly, its a city better suited for living in rather than visiting. As for the people. I´ll admit that at times they have seemed less happy, less friendly, and less welcoming at first glance than in other countries. They definitely don´t compare to the Mexicans. However, you just have to make the slightest effort and they instantly open up to you and are eager to have a chat. For the record: I never had trouble finding a place to camp, I got more free bananas here than in any other country this trip, and people would often go out of their way to help me. In the end, I am forced to conclude that all those angry, horrible reviews I´ve been getting from other travelers has been a reflection almost entirely of the higher prices. People find them offensive. 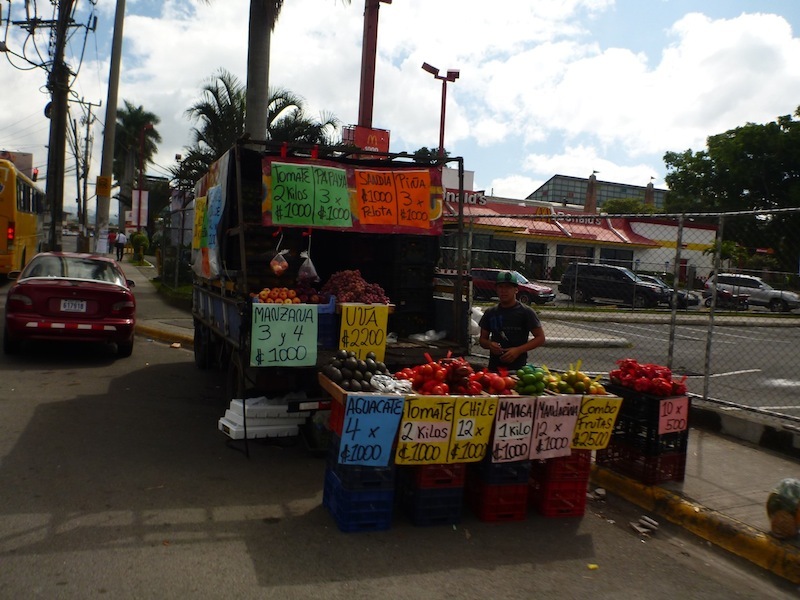 It´s as if the prices in Costa Rica are not subject to free market forces of supply and demand, but rather have been raised intentionally in a brash act of Tico arrogance designed specifically to spite the budget backpacker. I theorise then, that backpackers rush through the country, stopping in only one or two heavily visited areas, judging them all through some form of poo-tinted sunglasses before popping out on the other side, taking a deep breath of franchise-clean air, and sharing the tale of their horrendous experience in the land of Pura Vida. My message to budget travelers is this: If you are short on money or short on time skip Costa Rica because you will find more of what you are looking for in the far cheaper less-developed countries around it. However, if you do decide to go, take the country for what it is, enjoy the incredible gifts it has to offer, learn to say “pura vida” after every other sentence, and be prepared to see in its natural environment a species you will struggle to find anywhere else in the world: Costa Ricans. Finally, unless you spend a significant amount of time and money getting to know the country… please don’t hate on Costa Rica.